If you're looking for Mantis Rototillers on sale, this is the place. I've looked on a bunch of sites, and found great deals here. Hello my fellow Mantis lovers! On Saturday before Thanksgiving, we put the "house to bed" as well and headed south for Florida, where we'll be spending the winter in Port Orange! But, we look forward to coming back to the beautiful north country of New Hampshire in the spring, and getting the garden ready for a new season! I sincerely hope that you all enjoyed this season's series of posts about our garden! If I see anything that looks like fun down here in the southern lands, I'll be sure to post them! Our "Mantis Rototiller Garden" RESULTS! FINALLY! Here are the results of our garden! See the video below. :) Just today, John went into the garden and AGAIN came out with about 3 pounds of yellow beans and a handful of beautiful carrots! It's going to be a feast of veggies for the next month or so here! Anyway, the video below shows what the garden looks like right now. Enjoy! Mantis Rototiller and Spring Tilling! Hello Fellow Mantis Rototiller Users and Friends! Yikes! I was just reminded by a kind reader that I had NOT updated this blog in a while! I promised to show you our Mantis Rototiller in ACTION, and I mean to keep my promise! Although it's already August, I did take some videos the day we finally had good enough weather to do the planting. In many parts of the country, early June is already the height of summer weather, but up here in the mountains of New Hampshire, it's still springtime. I did the filming on June 6th (you can see that we still have lilacs in the opening scene with the butterfly) - and it was truly one of those days where all is well with the world. Anyway, here I have - for your viewing pleasure - the video of "Tilling and Planting Day!" And remember... If you want to buy your Mantis Rototiller direct from the company while still supporting little ol' me, I most certainly appreciate your business! Rain Rain Go Away! Even OUR Little Mantis Rototiller Can't Perform Miracles! So, the picture you saw of John running our Mantis Rototiller in the front beds last week (see our last post, "Introducing OUR Mantis Tiller") was the last sunny day we've had since! While we - gratefully - are not experiencing tornadoes up in northern New Hampshire, we have been getting a lot of rain. Fortunately, we live in the mountains and not a flood plain. But yesterday, we drove along the Androscoggin River in northern New Hampshire, and saw that a lot of people's farm lands and gardens are under a great deal of river flooding. We did get a truck load of composted manure to load into the garden - and by the time we had unloaded it, we had to call AAA to get our vehicle towed away from our own garden and lawn. We didn't realize how soggy our own field had gotten over the last week. So, we regrettably do NOT have pictures yet of our 2-cycle Mantis Rototiller workhorse tilling the garden. John wanted to try again today (Tuesday), but it would have just been "mud soup." Introducing OUR Mantis Tiller - Our Beloved Small Garden Cultivator! I promised that when we got home and took our own beloved Mantis Tiller out of winter storage, I would show it to you. Voila! This is the FIRST nice day since we've been back in New Hampshire, and so we decided to get our salad greens and flower beds ready. John took our old Mantis Rototiller out of the garage, and while he DID have to replace the spark plug, he got it back up and running in no time. We have the 2-cycle model, so it takes the gas/oil mix. So, there we have it... A somewhat sunny day, good old fashioned dirt, our Mantis Tiller, and a few packages of lettuce seeds and flower seeds - and we can officially hale the start of Gardening season! Below are some GREAT deals on Mantis Tillers (If you're price conscious, Amazon has really got the best prices I've seen), so get yours now! Picture of MEGA-VEGGIES from my "Mantis Tiller Garden!" 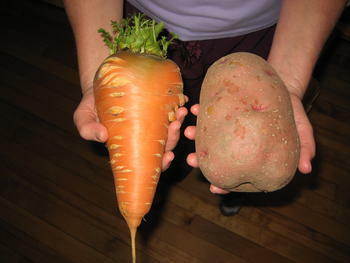 Both the potato and carrot weighed MORE THAN 1 POUND EACH! And, no, the soil wasn't treated with anything more spectacular than compost that year (these photos are from a couple of seasons ago). We haven't fired up our little Mantis Rototiller yet - it just snowed yesterday! :) But I'll get some photos soon! Best Way to Buy Your Mantis Rototiller FROM Mantis Themselves! You will still be buying directly from Mantis - but when you go through my links on that page, I will be given a small commission as my payment for helping market the product.